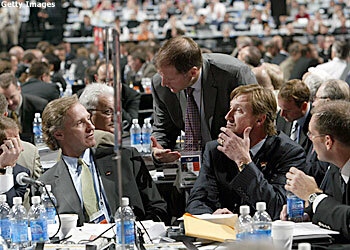 Edmonton Oilers GM Kevin Lowe received many trade offers for Joni Pitkanen over the course of the weekend at the 2008 NHL Entry Draft. OTTAWA – Edmonton Oilers General Manager Kevin Lowe said he received plenty of trade offers over the course of the weekend, many of which involved defenseman Joni Pitkanen. However, Lowe couldn't find a match to his liking and admitted that he's always open to offers regarding any of his players. "There's a lot of interest in Joni, but if people want to come to us and ask us about our players and are making offers that we think can improve the hockey team, we'll listen to anything," Lowe said. "There's no players that are immune to that sort of discussion." Hey, I know you –- New York Islanders coach Ted Nolan saw a familiar face when Josh Bailey was selected in the first round by the club on Friday night. Bailey was a teammate of Nolan's son, Jordan Nolan, on the Windsor Spitfires. Jordan, who was eligible but went undrafted this weekend, had 13 goals and 14 assists in 62 games for Windsor this season. "I saw Bailey play a number of times," the Isles' coach said. "But I watched him more as a hockey fan than anything. My son played on the same team. He's going to be a good player down the road." Giving his due –- Los Angeles Kings Director of Pro Development Mike O'Connell had a pleasant surprise while watching the Detroit Red Wings celebrating their Stanley Cup victory. "They were interviewing Brian Rafalski and he said his childhood idol was Mike O'Connell because I was a short defenseman who shot from the right side and moved the puck well," O'Connell said. "I'd never heard him say that before but that's pretty nice when a Stanley Cup winner says you were his idol. Brian Rafalski is a very good hockey player." A perfect fit –- Boston College dropout Ian Moran is here with FASTHockey Radio, and that should be a natural fit for the engaging former defenseman for the Pittsburgh Penguins, Boston Bruins and Anaheim Ducks. Moran was one of the first NHL players to wear a microphone while playing in a nationally televised game and he was hilarious in his exchanges with his Bruins teammates. Moran grew up in Acton, Mass., west of Boston, and is three years older than current Pittsburgh defenseman Hal Gill, another Acton native. Moran was told he was Gill's childhood idol. "Yeah, thanks," Moran said. "Hal's one of my best friends. In fact, he's going to be godfather to my fourth child, Leighton." Moran said he was very happy for Gill when he was traded this past season from the Toronto Maple Leafs to the Penguins. He agreed that Gill was a perfect fit, not just because he was the strong, stay-at-home defenseman the team needed, but also for the character qualities he brought to the team. "Having played with Pittsburgh, I knew he would fit right in with that team," Moran said. "He did a great job and they were a better team after they got him." The reason Moran "dropped out" of Boston College was to begin his professional hockey career. He spent two seasons with Cleveland in the old International Hockey League before the Penguins brought him up to play in the 1995 Stanley Cup Playoffs. Moran was one of the older players negatively affected by the work stoppage three years ago. He couldn't find a regular role with Boston or Anaheim and played part of a season in Germany before signing with the New Jersey Devils last season. "I played 12 games with the Lowell Lock Monsters and popped my knee," Moran said. "Now, I'm Reggie Dunlop." Measuring stick –- One of the European scouts had a chuckle over the "No smoking within 9 meters" sign outside Scotiabank Place. "There's an example of a Canadian still thinking in feet and inches," the scout said. "In Europe, we'd say 10 meters, but whoever posted that sign was thinking in terms of 30 feet, or 9 meters. "It's like when they changed the highway signs in the early 1970s from 'Exit one mile' to 'Exit 1,609 meters.'" Excitement never fades -– For Carolina Hurricanes Director of Player Development Ron Francis, the sights and sounds of the NHL Entry Draft never get old. Francis, who retired from hockey in 2005 following a remarkable 23-year NHL career that included stints in Hartford, Pittsburgh, Carolina and Toronto, is also looking forward to watching the newest Hurricane, center Zach Boychuk, in action. "I'd say he has all the tools," Francis said. "He's very quick, can score and has a lot of hockey sense." Francis, who sat alongside Carolina President and General Manager Jim Rutherford during the two-day Entry Draft in Ottawa, couldn't help but reminisce about the day he was drafted with the fourth-overall selection by the Whalers in 1981. "It's a great day for so many kids and their families because you put in such hard work," Francis said. "I certainly remember the day I was drafted and how exciting it was for me and my family. Obviously, though, there's a little more work involved in it from this side of the fence than just having your name called but, nonetheless, it's still a very exciting time." School's out -- High school hockey in Minnesota was certainly represented well in the 2008 NHL Entry Draft. In fact, the Islanders grabbed two of the eight players selected over the weekend at Scotiabank Place. In Friday's opening round, Jake Gardiner of Minnetonka was the first scholastic player off the board when he was taken by the Anaheim Ducks with the 17th overall selection. On Saturday, Roseau's Aaron Ness, who this season was named Mr. Hockey as the best high school player in Minnesota, was drafted by the New York Islanders with the 40th overall pick. Derek Stepan of Shattuck-St. Mary's went to the New York Rangers with the 51st pick, David Toews of Shattuck to the Islanders at No. 66, Justin Jokinen of Cloquet High to the Buffalo Sabres at No. 101, Drew Olson of Brainerd to Columbus at No. 118, Joe Gleason of Edina High to Chicago at No. 192 and David Carle of Shattuck to the Tampa Bay Lightning at No. 203.